The majority of parents desire to raise children who grow into adults with good habits. Why? Because good habits impact our lives and character. Deep down we all want our children to be excellent at what they do, right? Aristotle is quoted as saying, “We are what we repeatedly do. Excellence then, is not an act, but a habit.” Excellence is a habit and habits are learned and practiced. Instilling good habits in children offers great rewards as they grow and once they are adults. A child with good habits simply finds less trouble throughout his life. School days will never come without its challenges but with proper habits the days will offer some ease. You may have a child challenged by long division but you won’t have to battle getting work done or making his bed. Good habit training allows for less time battling over the small things which makes your life easier as well. The trick is implementing these habits. If we do not actively implement habits then we are passively teaching them and chances are that is a recipe for disaster. You are always modeling and teaching behavior, so you may as well make this time the most profitable. Make habit training your habit. Clearly communicate the behavior you expect from your children. For example, before entering a store, explain the behavior you expect. While in the store, you must model this behavior as well. After you do this a few times, before entering a store, ask your child what behavior is expected. The same process can be used for the habit or making the bed in morning. Explain and show how to make the bed. Model the same behavior. Then after a few mornings, ask your child what he should do before leaving his room in the morning. Asking your child what the expected habit is instead of reminding him, will aid in forming the habit. Everything we do on a regular basis forms a habit. You don’t want to form the habit of a negative atmosphere in your home. Children are encouraged by praise. When a child performs a habit successfully, praise the child. Simply tell the child you are proud of him for remembering and performing the habit. A little praise will go a long way. While a child is starting to learn a new habit it is important to be patient and encouraging. However, at some point, it is possible the child is being disobedient. Allowing disobedience to continue will disrupt and is contrary to all habit training. It is important to allow natural consequences to disobedient behavior for habit training to succeed. For example, if your child forgets to do his laundry, then don’t do it for him. Let him have to deal with his lack of attention to that responsibility. 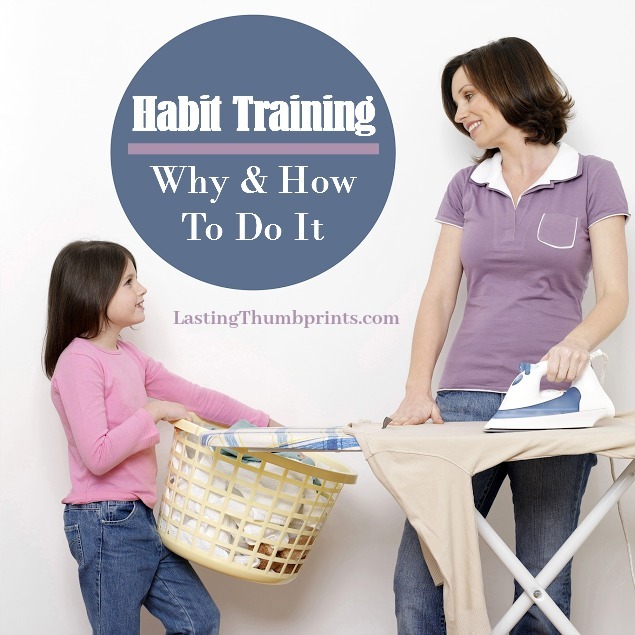 Ready to get to work with your children on habit training? I have a free 30 day habit tracker that can help! Just write in the habit(s) you are working on and mark each day you did the habit. You can decide on a reward or positive consequence for completing the 30 days. 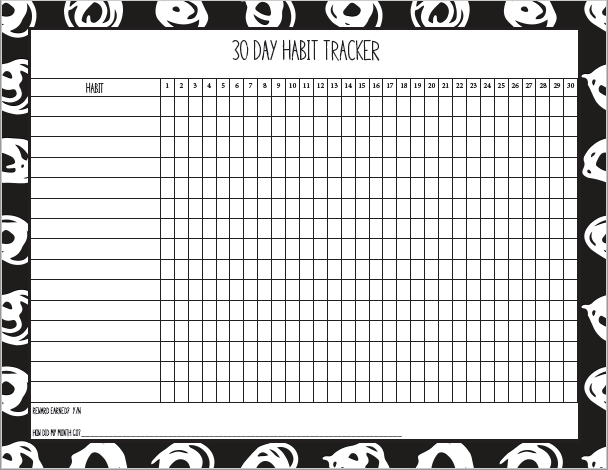 You can download this free habit tracker printable and more exclusive freebies and content when you subscribe to the Lasting Thumbprint’s newsletter below. What habits are you working on in your family right now? Previous Post: « Carrot Mini-Cupcakes – Perfect Easter Treat!